Green Dragon’s international crew includes top Irish ocean sailors Damian Foxall, Justin Slattery and Ian Moore and is skippered by double Olympic medallist Ian Walker Green Dragon, the Volvo Ocean Race entry, was welcomed to its homeport of Galway by a fantastic flotilla of boats from Galway Bay Sailing Club. Sailing onboard the Green Dragon on its approach to Galway was Galwayman and Green Dragon Director of Sailing Eamon Conneely. Galway will be one of eleven stopover ports for the Volvo Ocean Race 2008-09, from May 23rd until June 6th 2009 when it will host seven Volvo Open 70’s and an expected 140,000 visitors. Failte Ireland is the principal sponsor of the Galway stopover which is projected to enerate €43m into the local economy. During the stopover there will be two weeks of festival, concerts and fairs for the general public and it will be free for visitors to access. 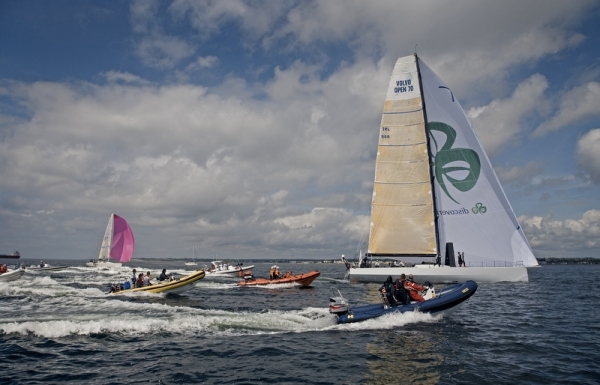 On the bank holiday weekend May 30th – June 1st there will be inport racing for the seven Volvo Ocean Race teams in Galway Bay. It will provide a chance for spectators to see these premier racing machines up close with the promenade in Salthill offering a fantastic viewing gallery. On June 6th the seven teams will depart for Gothenburg and the final stages of the race. The Volvo Ocean Race will start in Alicante with the inport racing on October 04 and departs from Alicante on 11 October 2008 and will sail to Capetown, Kochi, Singapore, Qingdao, Rio de Janeiro, Boston, Galway, Gothenburg, Stockholm and will finish in St Petersburg on 28 June 2009. It will cover 37,000nm and it is the first time that the race will have followed this route. deprivation, debilitating cold and gasping heat and where freeze-dried food is the set menu. You live in a cramped carbon fibre box with 10 fellow crew members in temperatures ranging between -5 and +50 degrees Celsius. At times 2,500 miles from the nearest landfall, you contend with Mountainous seas, 70 knot winds, the constant pounding of the waves causes your stomach to be set on spin cycle, and every ounce of emotional energy is stretched to breaking point. 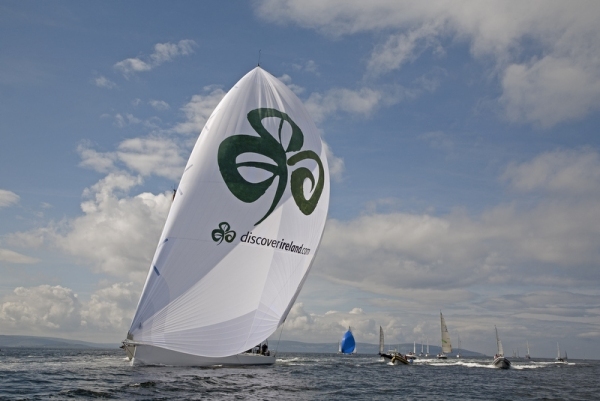 The Green Dragon Volvo Open 70 will be based in Galway until Thursday 31 July after which they will return to Cork for a short re-fit before heading to the Atlantic for their 2000nm race qualifier. Can you imagine being that close with 10 other people for 10 months?!?! I could never do that but these guys deserve all the respect in the world for making those sacrifices during a race.